Students are frequently far more creative than the tutors. The above was part of a great presentation by current CTET students Rana Ward, Claire-Cecile Desroche, Daniel Kingsley, Hilary Tulloch and Lucy Wrinn. 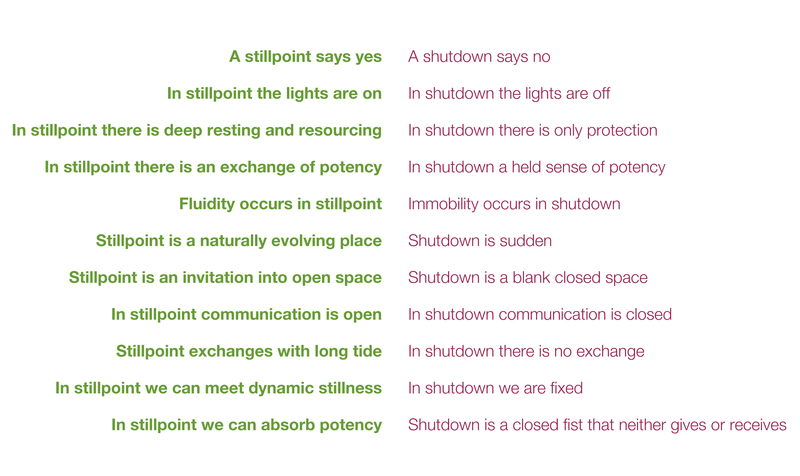 The question was about the differences between a stillpoint and a shutdown. If the force is completely overwhelming then the body can shut down as a whole. The body has gone into a contracted state that it is unable to shift out of. Shut-down can take place through a whole range of events that the body recognizes as too much to deal with. Therapeutically one of the most powerful things you can offer is listening to and acknowledging the body’s state. At first you can feel as a trainee practitioner that you need to do something to bring about motion. Be patient and recognize that the body is simply not going to shift out of this state in a short time. It will take time for the body’s resources to emerge. You will need to spend time with your client helping them to re-associate through verbal contact. Using language to help your client come into a felt sense of their body or part of their body can be an essential tool for re-animating the body intelligence. Your client’s system will need to feel safe in order to do this. It will need to know there is no present danger. Helping people out of shut-down isn’t a technique, so be patient and know that small changes are big things. The beginning of fluid motion can be a huge step for that person’s system to make and will almost always bring along with it trauma expressions. Don’t expect their system to leap into primary respiration; that takes time and the creating of a safe therapeutic space and relationship. Pretty good, but not quite as poetic. And thank you Steve for reminding us how to approach a shut-down.